If your nonprofit website includes an RSS feed, are you making the most of that technology? A free online service called FeedBurner turns your blog's RSS feed into a browser-friendly page that makes it easy for readers to subscribe to your blog updates. But that's just the beginning of what FeedBurner can do to help your nonprofit organization spread your message online. Automatically tell directories and web-based aggregators when you update your blog. Give your readers the option of receiving your feed content updates by email. Customize the title and description of your feed. Display your recent headlines in an animated graphic, most commonly used for signature lines on forums and in email messages. Create a mobile-friendly version of your site. Collect several feeds into one, or splice in your Flickr photos. Add links that make it easy for your subscribers to tag, bookmark, email to others, and otherwise share your content. Get subscription statistics to help you learn more about your readers -- who they are, how they subscribe, and what content they find most interesting. Set the amount of text from each post that's shown below each headline in your feed. Cross-promote content from one blog's feed to another. You can even password-protect a feed, to limit who can see and subscribe to it. Since July 2007, when Google acquired FeedBurner, a variety of useful "Pro" features such as advanced statistics (previously available only for paying accounts) are now available to all, free of charge. To sign up at FeedBurner.com, all you need is the web address for your blog, or the URL of your blog's RSS feed. The feed title and your new feed address will be filled in automatically, but you can feel free to change either or both of these if you like. Supply a username and make up a password for your new account -- and that's all it takes. FeedBurner will do the rest of the setup, even applying some of the most common settings to your feed to get you started. These settings can easily be changed or modified later, as you begin to explore all that FeedBurner has to offer. We'll talk more about some of those options in future posts. Meanwhile, your blog's RSS feed is transformed automatically into the browser-friendly FeedBurner format -- making it just that much easier for readers and members to keep up with your nonprofit's news and announcements. 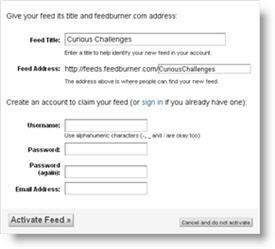 The FeedBurner sign-up process is simple enough, yes, and the benefits of "burning" a feed are not in dispute -- in fact, FeedBurner is fast becoming the internet standard for publishing and managing RSS feeds. But what about finding your way through the many optional features of the FeedBurner service? Is it always clear what each feature is intended to do for your feed, why you might want to use it, and how? If you're already an experienced FeedBurner user, what features of the service do you find most useful? What would you change, or add? The email subscription is key - responsible for more than 50% of our subscribers, but we still can't control how often it goes out. Right now, the emails go out ever day there is a new post, but I'd like each user to be able to control how frequent the emails are. I'm not sure I've heard of anything that will let users control the frequency of updates, Peter - short of setting up a separate email newsletter. It's an intriguing idea, though; worth snooping around to see if there are any workable options for this out there. I suppose the apparently limited choice for this kind of scheduling is because the main idea behind RSS feeds is to supply as-it-happens updates, so there's not a big perceived need for a delayed "digest" format of a feed. That's just a guess... Any other suggestions from readers are welcome - and I'll keep on keeping my eyes open for you, in the meantime! I've been desperately looking for an easy solution to this problem too. Readers subscribe via email. (Using Feedburner). They get an update in their email as often as once a day. However, they want (and I want to give them) the choice of updates: daily, weekly, bi-weekly, monthly, whatever. Why can't Feedburner do this!? Or.... Is there another service that can!? I don't like Feedblitz because they CHARGE EACH SUBSCRIBER for this feature. Bad. Even some tool that would take a Feed and Regulate the frequency it is updated. Like take one feed, and give you three versions of it: a monthly updated version, a bi-monthly, and a weekly updated version. (and, of course the original main feed would be the updated as-it-happens feed. Where can I find such a tool? It says it is a html page and do not like it. Where can I find the URL of my blog's RSS feed ? Note: If your blog is hidden with a Restricted Access Section, RSS feed will not be accessible to external feed reader software (as they can not supply the appropriate username and password to access the RSS feed). Such a blog can only be read within your site, as a regular web page. That was I thought all along. No Feedburner for restricted blog. and repeat the same entry in an email blast to all. That makes sense, Roger. The point of RSS is to "syndicate" your content to the whole world, but you want to keep your blog content private... so email blasts to your member list sounds like a good compromise.